Standing alone on the empty beach with her baskets, a despondent fisherwoman gazes out at the approaching storm. Two fishing boats tilt sideways on the sand behind her, marooned on the beach by the receding tide. A windmill sits high on the edge of the sands on the left of the scene. But Eugène Isabey made the dark, threatening sky the drawing's focus, concentrating on the murky black clouds that cover the leaden sea. Isabey conveyed the scene's drama through a subtle interplay of darkness and light. Dark sweeps of watercolor covey the looming storm, while white streaks of gouache suggest the faint glimmer of light on the horizon. The fresh, vigorous brushstrokes are visible in the tangled strokes that suggest the mounds of sand. 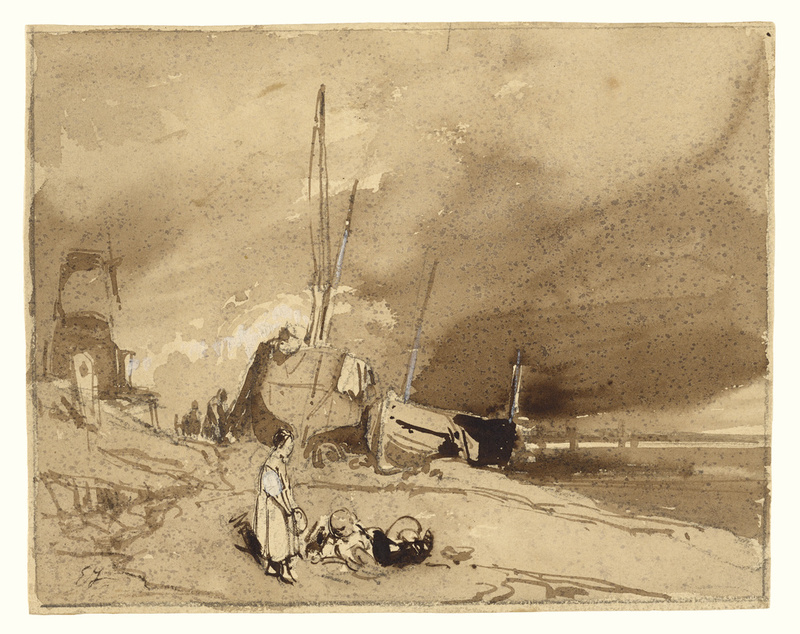 The scene's free watercolor technique and dramatic evocation of foul weather typify the Romantic landscape. In the 1830s Isabey produced a series of lithographs based on marine subjects; this scene probably formed the basis for one of them.